After making custard for the rhubarb crumble, I had so, so many egg whites left over. I’m not a big egg fan in general, so an egg white omelet doesn’t appeal to me. Let’s be real — the yolks are the main reason I can even eat that. So, since I can’t bear to throw food away, it was time to be creative. What to do, what to do? 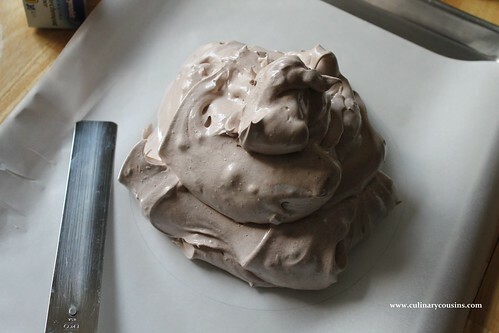 I considered making Jessica’s meringue cookies, but then … I remembered. 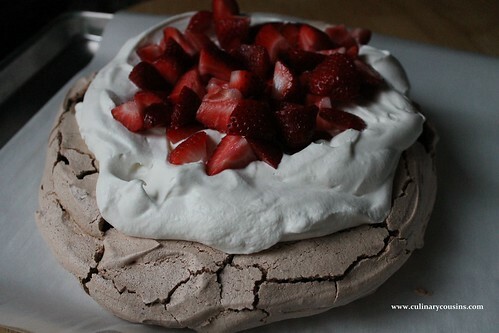 When I visited London last summer, my cousin’s wife, Jenmon, made the most decadent chocolate pavlova dessert with strawberries. As luck would have it, I had strawberries to use up as well. 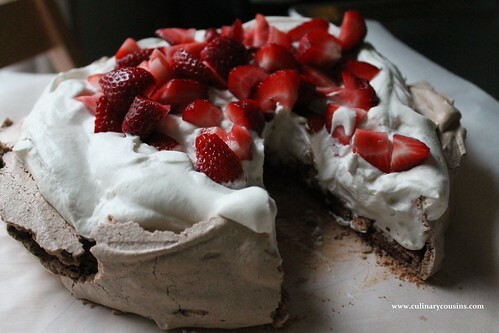 Inspiration: Jenmon’s perfect chocolate pavlova. 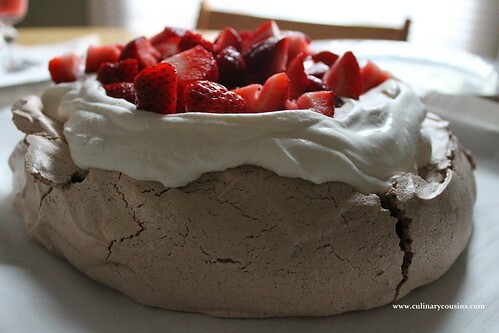 A pavlova is a meringue dessert topped with whipped cream and fruit — from Australia, I believe. 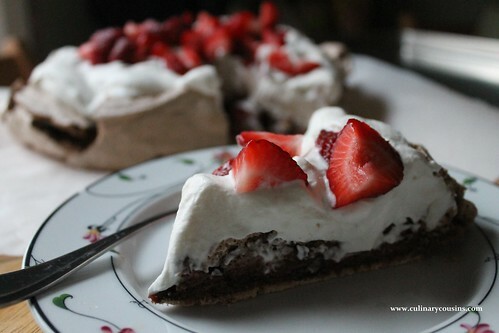 The meringue makes a round, flat disk that you can then cut in slices just like a cake. It’s light, airy, chewy and crunchy. The perfect sweet during the summer. You can make a regular vanilla meringue and top it with berries, kiwi, peaches — any fruit you like. Or, you can make a chocolate one, with strawberries or raspberries. For me, no contest. *No need to buy superfine sugar. Just whir about 2 cups of regular, granulated sugar in a food processor for about 30 seconds. Beware the sugar dust, though! Line a baking sheet with a piece of parchment paper. 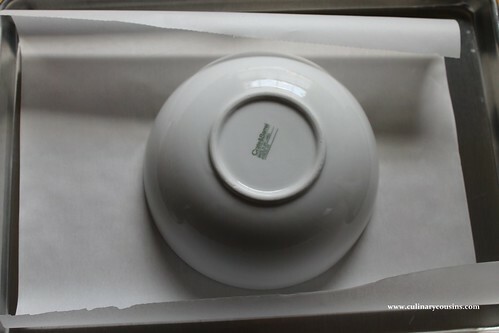 Find a bowl or plate about 9 inches in diameter. Turn it upside down on the paper and trace a circle. Flip the parchment paper over so that the pen/pencil side is down but you can still see the circle through the paper. Set aside. In the bowl of a stand mixer (a hand mixer works too), beat the egg whites on medium-high speed until white, stiff and shiny. Then, with the mixer on, add the sugar one heaping tablespoon at a time. Once the sugar is all mixed in, the meringue will be glossy. Shake the meringue remnants off of the beater and remove the bowl from the mixer. Toss in the cocoa, vinegar and chopped chocolate. With a spatula, carefully fold the mixture together until everything is well incorporated. To fold, you scrape the sides of the bowl and then flip over your spatula, running it through the middle of the bowl in a sweeping motion, so everything starts to come together but you don’t deflate the air in the egg whites. 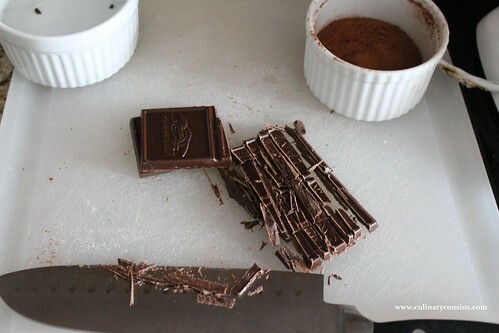 This may take a few minutes, but fold the chocolate in until it’s all mixed together. 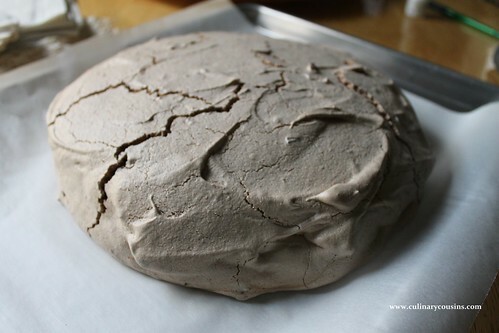 Scrape out all of the meringue into the center of the circle you traced on the parchment paper. 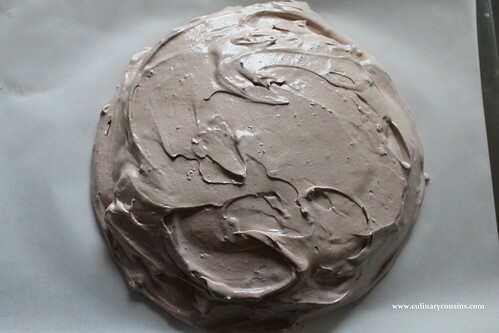 With a regular or an offset spatula (thin and flat, used for icing cakes), spread the meringue to the edges of the circle, then smooth the top and sides so that you have a wide disk about an inch or two high. 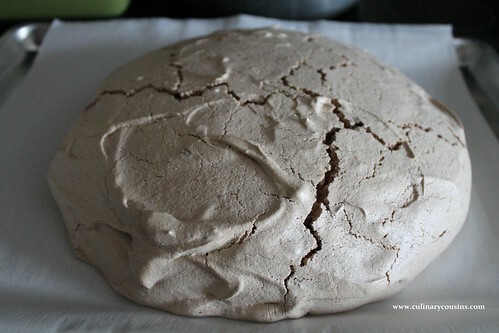 Put the meringue in the oven and immediately reduce the temperature to 300° F. Bake for one hour to one hour, 15 minutes. The top should look dry and crispy, but the center should be ever so slightly springy to the touch. Turn off the oven and but open the door just a bit. Leave the meringue in the oven until it’s completely cooled. Stir together the heavy cream, sugar and vanilla in a medium bowl. 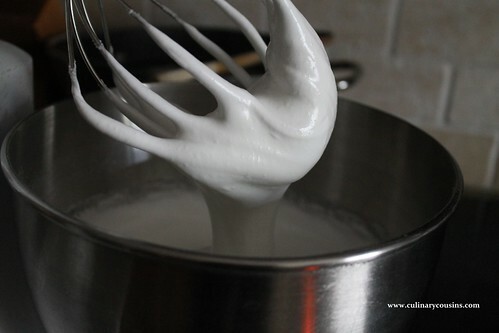 With a hand or stand mixer, beat the cream on high until it has soft peaks. When you remove the beaters, the cream should be thick and airy but still a little soft and goopy. When it’s cool, turn the meringue upside down on a plate and peel off the parchment paper. Turn it right side up again, top with the whipped cream and strawberries. Use a serrated knife to carefully cut wedge pieces, just as you would a cake or pie. Indulge. Adapted from Nigella Lawson’s Chocolate Raspberry Pavlova.